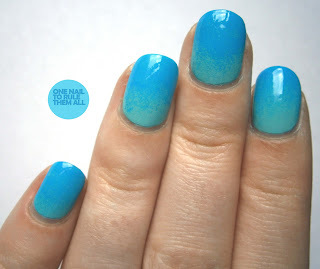 I was a bit worried about today's challenge because I've never done gradients before, but it is SO easy. I was told a variety of methods of doing them but I actually found it easier to sponge with just one colour. I was so proud of these for a first attempt but my camera failed to pick up the colours properly, I promise that they weren't as similar in reality. I think gradients will be my new thing to turn to because they really are super quick and easy. Hope you like these nails!